Creekside Reservoir is the linchpin construction component of the Creekside Development Project. 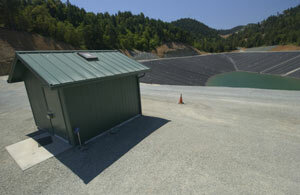 The purpose of the earthen dam and its reservoir is to store water pumped from the well field located near Seven Feathers Hotel & Casino Resort along the South Umpqua River. This water, stored during winter months, will be treated by the nearby water treatment plant and used as potable water for commercial facilities owned by the Tribe. The reservoir is fully lined. Dam Crest Elevation: 918.5 feet. Normal Pool Elevation: 908 feet. 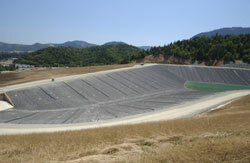 Reservoir Volume at Normal Pool: 365 acre-feet. Dam Height Above Ground: 95 feet. Embankment Type: Textured HDPE 80 mil. Dam Crest Length: 1000 feet. Spillway: 9 foot wide crested weir @ 908 feet. Outlet Pipe: 36 inch-diameter with three sluice gates with Hydraulic controls. Outlet: Stationary Pump @ 850 feet to water treatment facility, 1/2 mile away. The Reservoir is an integral part of the overall Creekside Development Project, which includes expansion of the existing Seven Feathers Truck & Travel Center, construction of the new Seven Feathers RV Resort , construction of an irrigation lagoon and upstream reservoir, expansion of the existing water treatment facilities, development of supporting infrastructure, and construction of a new interchange at the nearby I-5 exit, that will realign the underpass and reconfigure the freeway ramps. TCB Construction, Inc, Salem, Oregon - General Contractor. Early detection of potentially dangerous conditions and establishment of procedures for reliable and timely classification of an emergency situation are essential to ensure that the appropriate course of action is taken should an emergency occur. An early decision about declaring an emergency and initiation of the appropriate Emergency Action Plan (EAP) procedures are critical to maximize available response time. The rule is: It is better to activate the EAP while confirming the extent of the emergency than to wait for the emergency to occur. All instruments with the exception of inclinometers are connected to an automated data acquisition system. Inclinometers are monitored manually in the field on a pre-determined frequency. Remote sensing data are continuously transmitted to a designated computer station at the Water Treatment Plant and are available for review and interpretation in a real time regime. The post-processing software analyzes the data from each instrument for unusual trends and compares readings to predetermined threshold values. An alarm message is automatically sent by email and a text message to designated Water Treatment Plant personnel. The Water Treatment Plant, located a quarter mile above the reservoir on the left abutment, is attended 24 hours a day. Plant personnel are trained in dam safety monitoring and will normally be the first to respond to an emergency at the reservoir. Condition A: Failure is imminent or is occurring or has occurred. In condition A, there is no measure to arrest failure and mandatory evacuation from the anticipated inundation zone is triggered. Condition B: Conditions are deteriorating and a failure may eventually occur, but there is no indication of imminent failure. There is still time to further assess the situation and implement corrective measures to minimize or arrest failure. Some preventative evacuations and temporary closings may be warranted. If conditions worsen, it may become necessary to elevate the status to Condition A. Condition C: There is no immediate threat to dam safety, but some flooding is expected to occur downstream, and some repairs may be necessary. Generally, evacuations and temporary closings are not required. If conditions deteriorate the emergency status may be elevated to Condition B. Flooding as a result of a severe rainstorm, snowmelt, or windstorm; whether predicted or during such an actual event. Seepage in old seeps, increased flow through the weirs, or if new springs, sandboils, or seeps appear. The actual emergency responses are governed by emergency notification of Tribal members, employees and contractors. Who is contacted and in what order are specified in detailed, up-to-date flow charts containing specific personnel names, phone numbers and other relevant contact data.